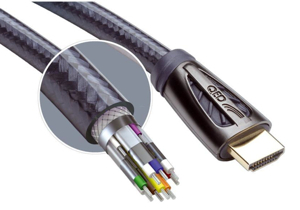 All about the QED Digital & Analogue Interconnect Cables. To get the full potential from new generation digital amplifiers and DACs, you need quality digital cables. These need not be crazily expensive. Good design, construction and termination go a long way to delivering you a significantly improved performance. We've looked at many options and have settled on the British QED range which is both great value and a perennial favorite of reviewers. In any system, you may actually end up with a mixture of different types of digital cables. There is Optical and Coaxial for digital audio, USB for connection from many computers, and HDMI for both picture and sound. With some components you will also have a choice of different types of cable you can use - and you may be surprised to learn that there are real differences between which type of connection you use. For example, in home cinema systems, HDMI is used for both picture and sound - there is no doubt that it's brilliant on the visual side and you will certainly appreciate what you'll see with a better grade of HDMI cable. But what you might not know is that the HDMI system isn't that great on the sound side of things - if you route your digital audio signal via optical or, even better, a coaxial cable you'll get and immediate improvement for a modest outlay. Jitter is the enemy in digital audio and the task of better digital interconnects is to reduce this - you can make the greatest gains with the Coaxial cables, and if you have the option of taking this route, then investing in a better quality cable will be money well spent on your musical enjoyment. If connecting any disc player with one of our over-performing DACs or amplifiers from NuForce, even the most costly Signature cable is easily affordable - especially when compared with esoteric analogue options. If you have a choice between coaxial and optical, we do suggest that the former connection is best - you have two less stages of conversion, and all things being equal, the sound you'll get from the coaxial cable connection will be both richer and more detailed. Choose from 3 grades within the QED range - at each step there is an obvious and worthwhile improvement in sound quality. With lossless and high resolution files, you'll really appreciate the difference you hear. With Optical cables, there are significant benefits to be heard with better options. While QED's entry level cable is just $49 in fine in basic systems, the better Performance series is far more appropriate with anything we sell. And the new Reference Optical Quartz is the easy choice for serious music listening. It's all in what the cables are made of. Cheap optical cables are just a single stand of clear(ish) plastic - and not startlingly good plastic at that. You might think that with digital and light, there wouldn't be much difference. But even over a metre you can get big comparative losses which limit bandwidth. And really terrible jitter performance. The better QED Performance optical cable has a highly pure polymer which makes for better transmission and lower jitter. Yet this is comprehensively outperformed by their real glass fibre cable - Reference Optical Quartz consisting of 210 separate boro-silicate glass fibres. Because the fibres are so small the different paths taken by the light rays are similar in length virtually eliminating the timing error and introducing less distortion and jitter. This has the effect of increasing bandwidth and the accuracy of the data transmission. The new Oppo and Cambridge BluRay players have awesome picture quality - the trick is to get this to your TV screen or projector. The bigger and better the screen, the more obvious the difference is. Quite often you'll want a slightly longer cable as it can be a stretch to get from the system to the screen - so we have lots of options with the QED HDMI cables - both flat and round, 1m right up to 15m for projectors and Active cables to deal with these situations. Finally in our array of digital cables we come to what is probably the best value of all - the USB connection between computer and DAC or amplifier. This is potentially the best of all in terms of performance and it follows that the differences between USB cables will be even more apparent than in other settings - yet QED's USB cable is the lowest in cost of all. Simply put, there is no excuse for not getting one. There is inevitably going to be some point in any system where you will have analogue cables - we are not about to change our strong preference for Kimber interconnect and speaker cables - But if you need a good quality affordable interconnects, QED do provide - we've got a range of the basic interconnects in stock which provide a happy mix of affordability and great sound - that's what QED is all about!